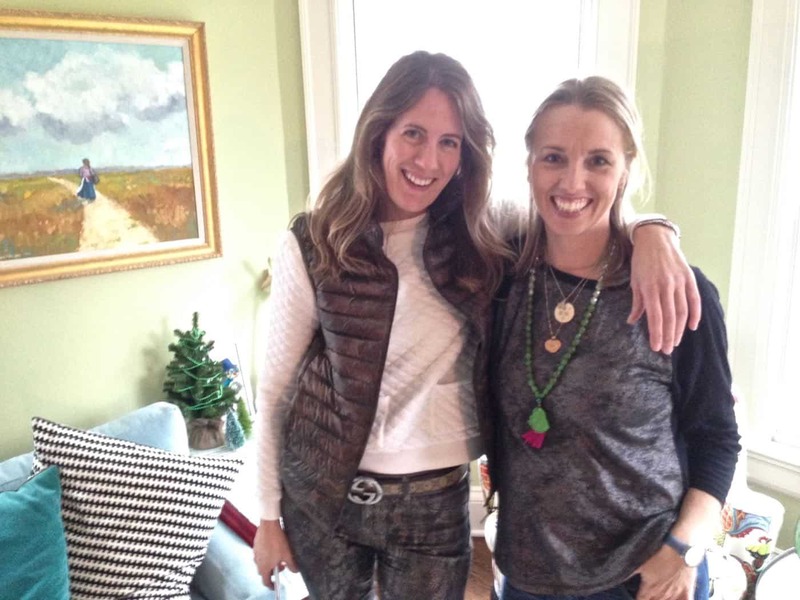 The Better Homes and Gardens story of stories… comin atcha. Dishing about my Better Homes and Gardens photo shoot on the blog. TODAY. Once upon a time, I finished redoing a tiny miniscule Lilliputian powder room with my own two hands. Probably because the previous iteration of said powder room was SO awful, I LOVE this powder room. I shared it. I posted it. I told anyone who would listen all about it. This included Better Homes and Gardens. I attached a few pictures… and hit send. And… nothing. Because this was going to be in the March Issue, they were hoping to schedule the shoot “soon.” And by “soon”… they meant in 3 days. Gah!! Thankfully this meant I literally didn’t have time to run around like a crazy person dusting my toilet paper rolls and polishing the baby monitors. I was told to have some outfits ready that would complement the piece (maybe the green in the dining room curtains) and that most folks just wear dark pants and flats. A couple of days later, I connected with the stylist, Stacy. 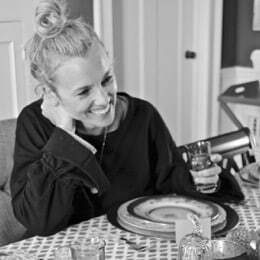 I would like to have a slumber party with Stacy so we can stay up all night flipping through design magazines and dishing about vignettes and damask and wood stain. The plan was to move the file cabinet to a different wall in the dining room, and Stacy asked me whether I had any smaller pieces of art that might work hanging above it. Um, yeah… we have plenty of artwork cluttering this house! 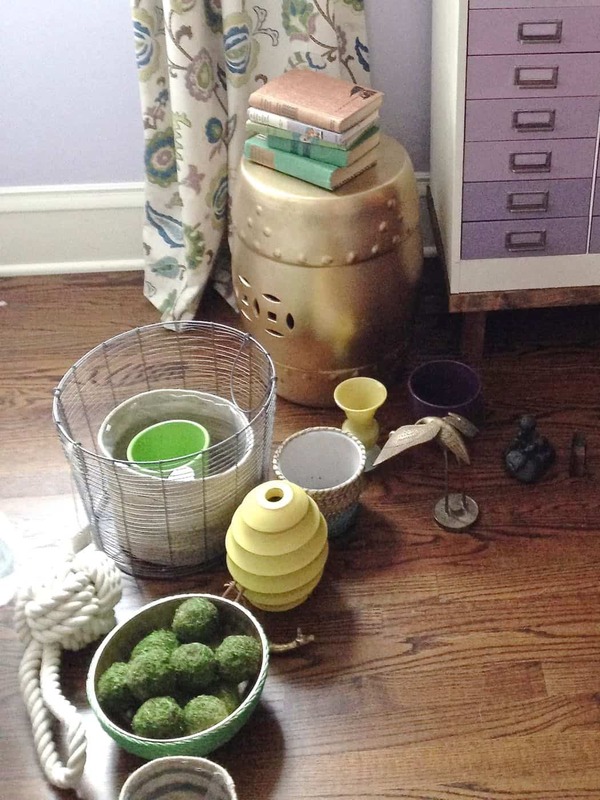 (She was also curious about my vases, but turns out that selection is on the boring side.) Skip ahead to Wednesday. I’m like a nine year old when it comes to my hair… I can kinda brush it and get it into a ponytail. Meaning I made the executive decision to run over and get my hair blown out before Stacy and her merry band of photo minstrels were due to arrive. 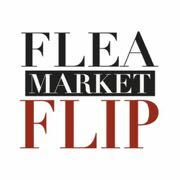 Blowout note: if the adjective flippy is used, be wary. Stacy and Michael, the photographer, and Dave, the tech guy showed up with gear. Lots and lots of gear. Photo gear, lighting gear, computer gear…. GEAR. They rolled up the dining room rug, tarped the whole room for lighting, set up the computer, and generally were awesome and ready to shoot within 90 minutes! Meanwhile I took Stacy upstairs to review my wardrobe choices and she quickly skipped any and all items with a price tag still on (oh well…) and opted for two shirts I’ve had for ages. The first, a FAVORITE (yay! ), the second a not so favorite (boo…). I took the liberty of grabbing the shoes I was most likely to wear (green clogs) and a handful of accessories. While I was changing clothes and putting on some makeup (thanks to my time on TV I actually know how to apply makeup… yay! 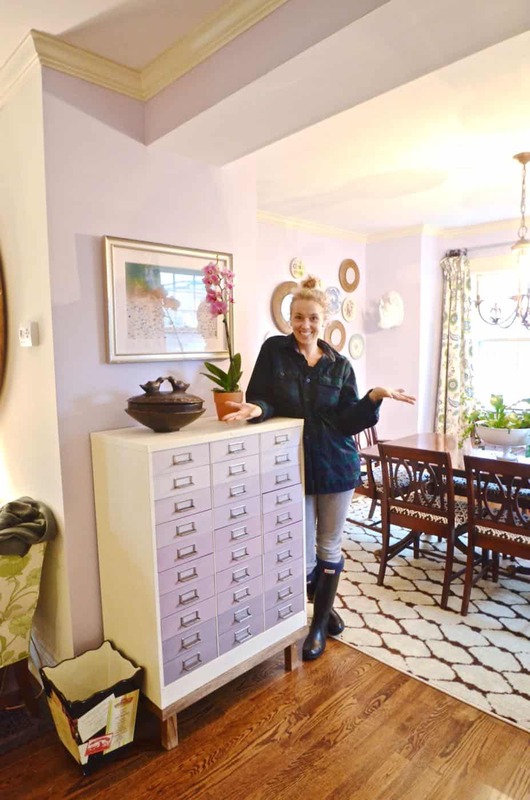 ), Stacy had run around like some super chic, super talented house elf and made my ombre file cabinet look a million percent cooler than it has EVER looked in its life. Even her plant looked cool. I can’t show you any of these pictures until the issue comes out in early/ mid February but trust me… the whole thing looked like a better looking stunt double of my file cabinet with a better looking version of every little tchotchke I have sitting around the house. I did my best Project Runway smeyes and stood hugging the file cabinet for half an hour. Every photo popped up immediately on the computer complete with the graphics that would be on the actual magazine page. And any files where I wasn’t cross eyed or sticking my tongue out were sent directly to the art director of the magazine to weigh in and tweek. I ran up and put on my unfavorite outfit, Stacy shifted around some accessories and we went in for another round making love with the camera. Nope. Not even close… I was still just standing there. You guys… the whole thing took maybe 4 hours. Granted, that’s a long time for one photo, but still… they were gone with the wind fabulous. 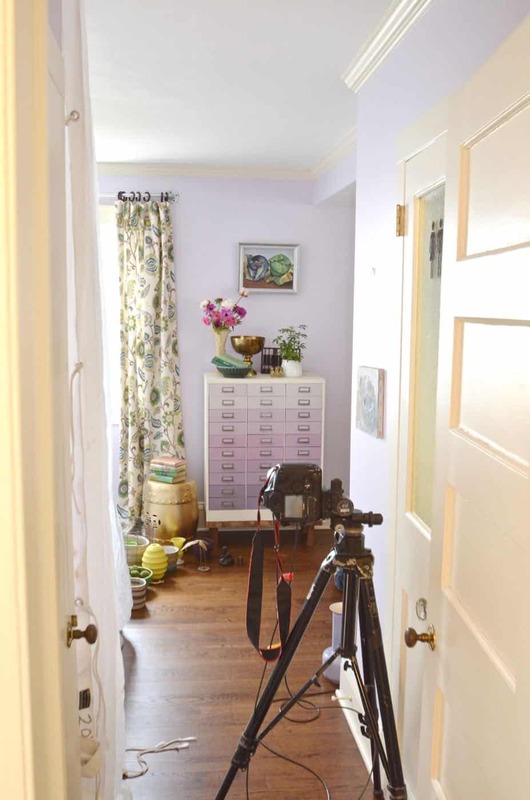 I can’t imagine a whole house tour, but… professional photographers and stylists are magical creatures. Our dining room looked like a crime scene with plastic draped everywhere and and the crappy little dish I had in the basement from Goodwill looks like some Jonathan Adler creation after 15 minutes under the bewitched fingertips of Stacy the Supreme. I’ve seen the proof and THEY USED MY FAVORITE TOP so that’s exciting. My hair is on the flippier side of flippy than I would have liked but you can feel the love I have for that ombre, I tell you. And all the accessories were mined from my very own basement with the exception of a vase and a flowerpot… so my hoarding tendencies seem to have paid off for the time being! Update: See the cover below!! Woohoo! so cool! I can’t wait for my magazine to come!! congrats and how fun. i love all the behind the scenes and what a dreamy day even if it was a whirlwind! Congrats girl! That is awesome! I hope to be you someday! You will be! I couldn’t believe it when I got the email! Thanks!! Yay! I will be sure to buy the issue. Congrats Charlotte! NO WAY!! Where did you ditch the kids for 4 hours. 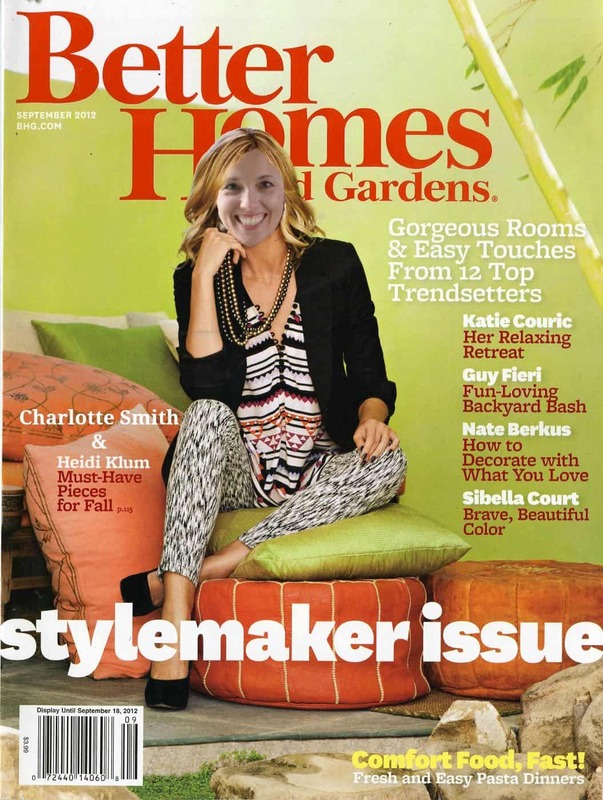 For the first time in at least 60 years, I will buy a few Home and Garden mags! HAHA! I’ll tell the editor that’s where the profit spikes came from. 😉 We have an amazing sitter who’s used to them… and 2/4 were in school so that helped. Thanks! Charlotte!!! This is beyond cool. Can’t wait to get the issue! You are adorable and hilarious and I cannot wait to see the picture!!! Amazing, Charlotte! Congratulations!!!! Can’t wait to pick it up! Whatever, totally buying it. “I know her! I KNOW her!” Also, you should hit up your pal Lava… Lil disappointed that your FMF episode hasn’t hit Netflix yet. I’m JUUUUUST coming down from Cloud 9. I’m so happy for you! I can’t wait to see it. Congrats girl! Loved reading the dirty little secrets behind what it really takes to capture a photo. Now that you have a few tricks up your sleeve, the pressures on, ha! 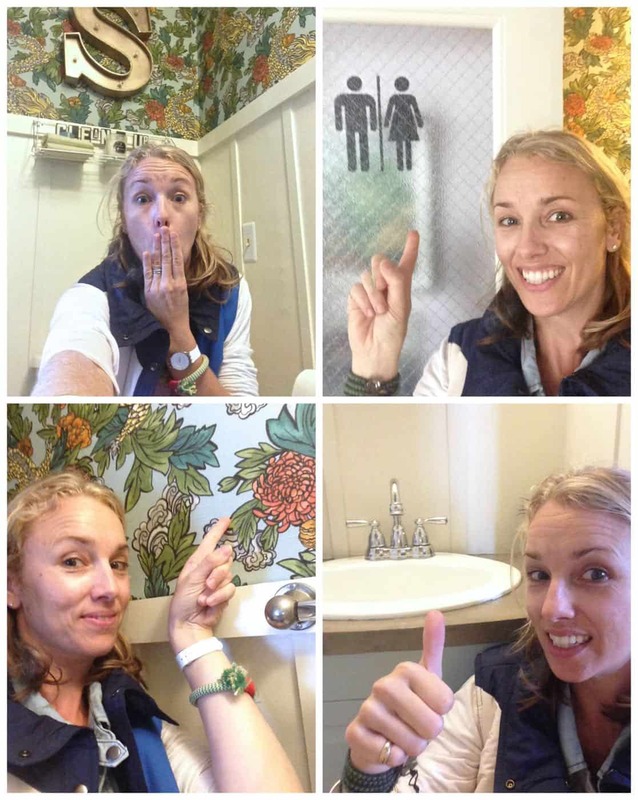 Congrats on the bath-shoot and the quirky door is a clever touch. 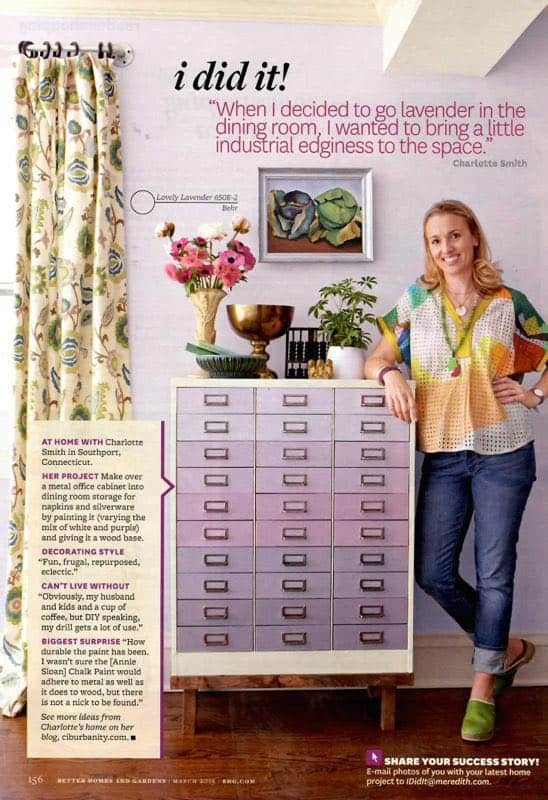 Charlotte, loved the cabinet featured in BHG and was excited to discover your blog. But I must know… what brand are those green clogs? They are as cool looking as the cabinet! Ha! I LOVE those clogs. I got these at the website http://www.clogs4u.com, but not sure if they’re still there. Mine are old. The brand is Vollsjo from Sweden. Hope you can find them!! 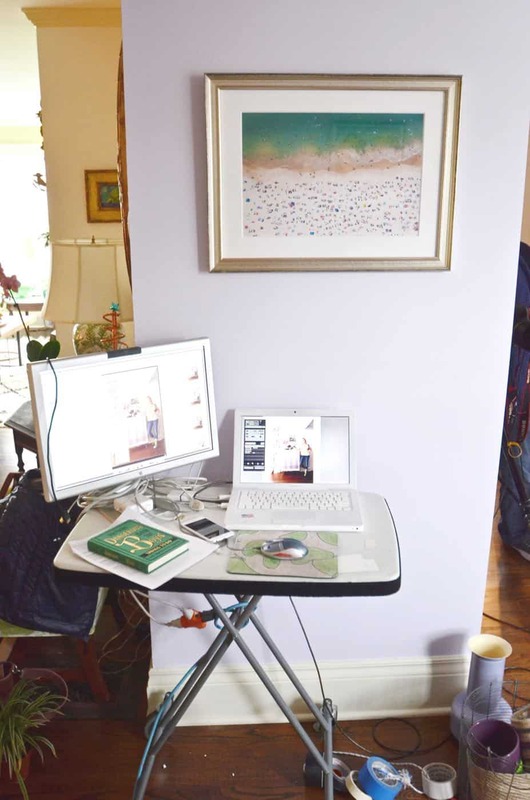 I loved the picture in the magazine, which is how I came to know about your wonderful blog. 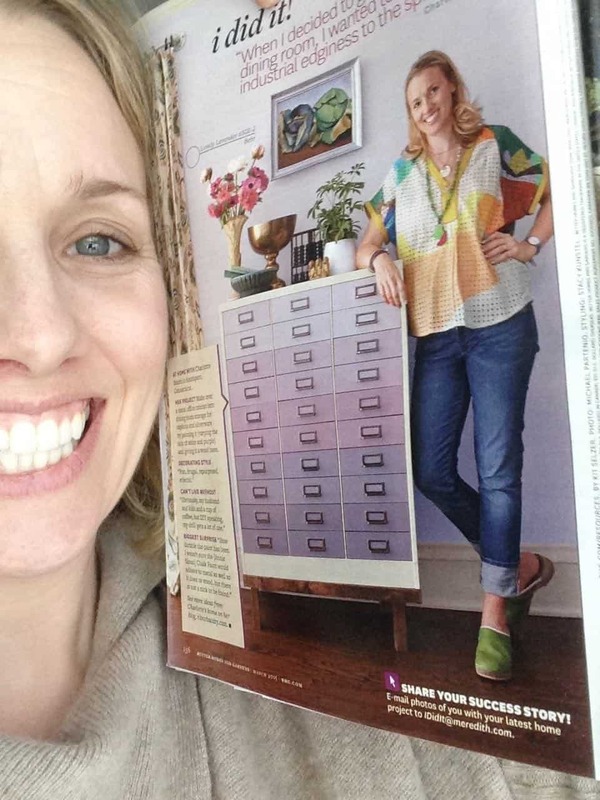 Did someone make the shirt for you in the Better Homes and Gardens photo? It is fabulous!!!!!!! Thanks, Mindy! 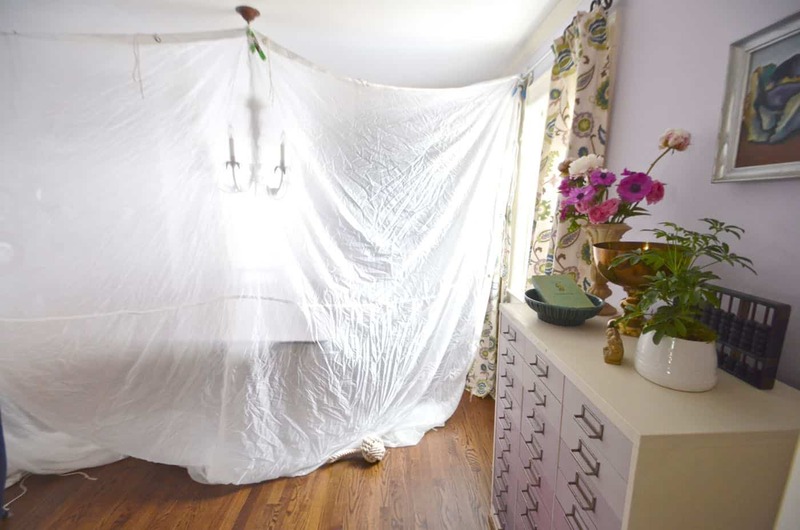 Those drapes are DIY (here’s the link: http://ciburbanity.com/2014/04/22/fabracadabra-curtains/). The fabric is from Online Fabric Store and is amazing. I love it. It’s called Braemore Selim in the color Heather… Looks like OFS doesn’t carry it anymore, but this is a link to a different color: https://www.onlinefabricstore.net/braemore-selim-punch-fabric-.htm Otherwise, I’d just search for the name and hopefully it will come up! Good luck! Lol! Is it Considered stalkerish to comment From a post posted almost 3 yrs ago?? I too loved lavender & had my brother paint my Kitchen this color about 6 years ago! I miss this kitchen!! I’m Gonna tag you in my insta post on it! Plus, i Just signed up for your blog! Lots of funny here! !